US, 1951, 75 minutes, Colour. Abbott and Costello, Charles Laughton, Hilary Brooke, Lief Erickson, Fran Warren. 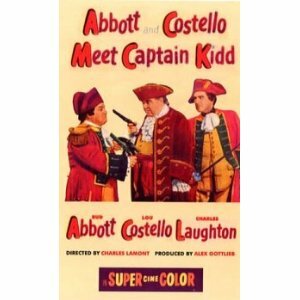 Abbott and Costello Meet Captain Kidd is not exactly the kind of film that one has serious discussions about. Rather, it is an example of the popular comedies of the '40s and '50s, an example of the teamwork of Abbott and Costello (and reminding audiences of other teams at this particular time, especially Martin and Lewis). The comedy is of the most basic, much of it slapstick, a lot of corny puns, some verbal humour, mimicry. Some of it is still amusing - but was probably much more amusing in its time, especially when audiences saw so many of the Abbott and Costello films. It is rather the equivalent of a television series today. Charles Lamont was a veteran director of this kind of comedy in the '40s and '50s. The focus on the pirates resembles the pirate films which were particularly popular at that time. The film also adds in a number of superfluous songs, although some sung by the crew of the ships are rollicking. The plot is basic: Captain Kidd doublecrosses a woman pirate, Captain Bonnie, played by Hilary Brooke. They plan to go to Skull Island, but there is a mix-up with a love letter and the map. Eventually everybody goes on the boat, Captain Kidd and his crew, Captain Bonnie, Abbott and Costello, the heroine Lady Jane and the man in love with her who sings at the tavern, but who is press ganged into piracy. With the finding of the treasure, there is more doublecrossing and a happy ending with Lou Costello mimicking Charles Laughton and becoming the captain of the ship. What is of interest to film buffs is the performance of Charles Laughton. Five years earlier, he had played Captain Kidd in a more serious vein in the film of that title. Here, like many other actors as Boris Karloff, Lon Chaney, he joins Abbott and Costello in a spoof. He capitalises on his mugging skills and seems, in a rather deadpan and sometimes ironic way, to be enjoying fooling around with these comedians. However, it is not one of his greatest screen moments. Abbott and Costello were very popular for the best part of 15 years, and in the late '40s and early '50s capitalised on a series of films in which they encountered famous characters, especially Frankenstein and the Wolf man, as well as Captain Kidd. In the '80s there was a telemovie, Bud and Lou, starring Harvey Korman and Buddy Hackett as the comedians.